Spending a rare morning with her dad off the campaign trail one Sunday last August, Malia Obama was walking across Lafayette Park near the White House with the first family on her way to church, when a reporter shouted a question about her summer at camp. It was "good, thank you," she said, in true first-daughter form: Concise, but courteous, poised. 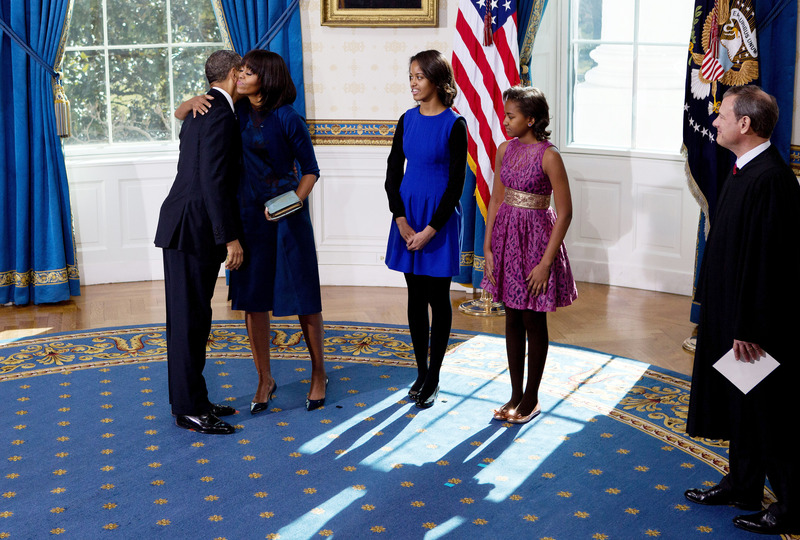 The 10-year-old girl America saw in a bright red dress on Nov. 4, 2008, beaming up at her father as he was elected the first African-American president of the United States, now nearly matched his six-foot-one-inch height. And by the time President Obama hands off his executive duties during Inauguration 2017, Malia and her younger sister Sasha will be a freshman in college and a sophomore in high school, respectively. It's a phenomenon the country is familiar with, but which usually happens on the other coast, in the surreal world of Macaulay Culkins, Lindsay Lohans and other child stars of Tinseltown: Particularly in the case of two-term presidents, the entire world watches as first sons and daughters progress through adolescence, very much in the public eye, and very much held accountable for their family's reputation. Despite rules and gentlemen's agreements that the press respect the privacy of the president's children, Malia and Sasha Obama have spent their formative years much more visible to the public than many of their predecessors. And aside from the obvious role of the Internet and social media, if there's a finger to be pointed for it, it's at their parents. Barack and Michelle Obama have developed a reputation for speaking freely about the goings-on of their daughters' lives. Journalists knew the girls had spent a month at a New Hampshire summer camp, for instance, because Mr. Obama mentioned it in interviews. The transparency hasn't been without its risks, and controversies. In October, a bomb threat was reported at Washington, D.C.'s Sidwell Friends School, which Malia and Sasha attend, and which incidentally has also enrolled in the past Chelsea Clinton, Tricia Nixon Cox, and Archibald Roosevelt. And then there was the bizarre, seemingly interminable episode when Malia last year ventured to Mexico with friends for her spring break amid warnings from Texas law enforcement over the country's escalating violence. After stories and photos of the trip emerged online, the White House demanded news outlets remove them, leading to what remained for a time a cycle of dead links; an inexplicable void in the world wide web. Months later, a conservative watchdog group said it would sue the Secret Service for records showing how much it cost to protect the first daughter on her vacation. The Obama girls, of course, are just the latest in the unique spotlight at 1600 Pennsylvania Avenue that's seen turns by the Kennedy kids, Chelsea Clinton, and Amy Carter, who at the age of nine caused a stir among foreign diplomats when she took a book out and read between courses at a state dinner. As Malia and Sasha journey toward "young adult" status, though, past precedent indicates their toughest scrutiny may be ahead of them. Perhaps the best example of what not to do as teenage progenies of the U.S. president comes from the last family to inhabit the White House. Four months after George W. Bush took his first oath of office, 19-year-old twins Jenna and Barbra Bush had racked up five alcohol-related citations between them, from attempting to buy alcohol with a fake I.D. to publicly consuming it as minors. In the 2009 book, "In the President's Secret Service: Behind the Scenes With Agents in the Line of Fire and the Presidents They Protect," author Ronald Kessler painted an even more cartoonish picture of the twins, including anecdotes about Jenna purposely running red lights in an attempt to dodge Secret Service supervision. Before the Bushes, there was Chelsea Clinton, who even having set what is now known as the "Chelsea Rule" - a treaty that has developed in recent years between satirists and commentators and the president that says kids of the first family are off limits - in 1993 found herself the subject of several controversial moves by media personalities. After a "Wayne's World" skit on SNL opened up as fair game the 13-year-old's somewhat awkward tween appearance, conservative radio host Rush Limbaugh took it several steps over the line, "joking" that Chelsea was actually the "White House dog." But Chelsea also demonstrated the resilience of first children against a prying public eye. During the last year of her father's presidency, at the age of 20, she assumed many of the first lady's responsibilities, including foreign trips and state dinners, while her mother Hillary Clinton was campaigning for the Senate. In the run-up to the 2008 presidential election, she campaigned for her mother, but would not entertain any media requests for interviews. Two years ago, she was named a special correspondent for NBC News. Presidential historian Doug Wead, who interviewed 19 children of former presidents for his book, "All the President's Children," suggested on "CBS This Morning" that Malia and Sasha will be able to largely escape the not-so-rose-tinted microscope that tends to focus on White House teenagers, in particular. He credits his prediction with the fact that the Obama family has managed to remain a unit, often in the same place, through most the president's political career. "It always depends on the presidency and their parenting style, and the atmosphere in the country," Wead said. "But I think they're going to look back on these as great years."